Share Your Opinions With Each Other! 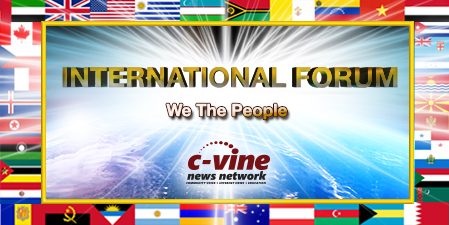 Copyright ©2019 c-vine.com - c-vinenews.com - c-vinenewsnetwork.com - c-vineforum.com and all its subdomains are divisions of C-VINE International Charitable Trust. In accordance with Title 17 U.S.C. Section 107, the material on this site is distributed without profit to those who have expressed a prior interest in receiving the included information for research and educational purposes. For more information go to: http://www.law.cornell.edu/uscode/17/107.shtml . If you wish to use copyrighted material from this site for purposes of your own that go beyond ‘fair use’, you must obtain permission from the copyright owner.